How crazy is current market action? …and if you lived through 2008, definitely not that crazy. Seeing a -3%+ or a +3% observation is roughly a 1/100 event, or ~ 2.5 times a year. Obviously, return events are not independent and volatility tends to cluster, but the numbers above establish a basic starting point for discussions about daily return action. Value-weight return of all CRSP firms incorporated in the US and listed on the NYSE, AMEX, or NASDAQ that have a CRSP share code of 10 or 11 (essentially ordinary common shares). There are 23,509 daily return in total. Daily returns are one thing–let’s review the top 40 stock market drawdowns over the past 90+ years. 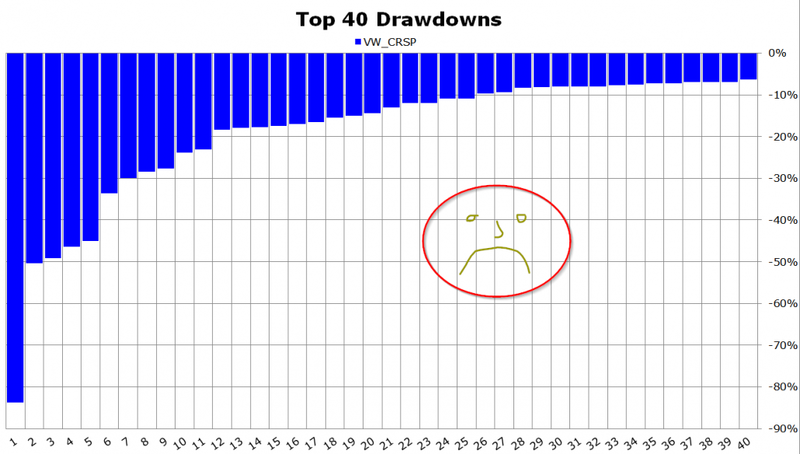 VW CRSP = Value-weight CRSP universe of AMEX, NYSE, and Nasdaq stocks (Basically S&P 500). Monthly returns, gross of fees, total returns (e.g., including dividends). Clearly, if you can’t handle volatility, you shouldn’t be in the stock market.